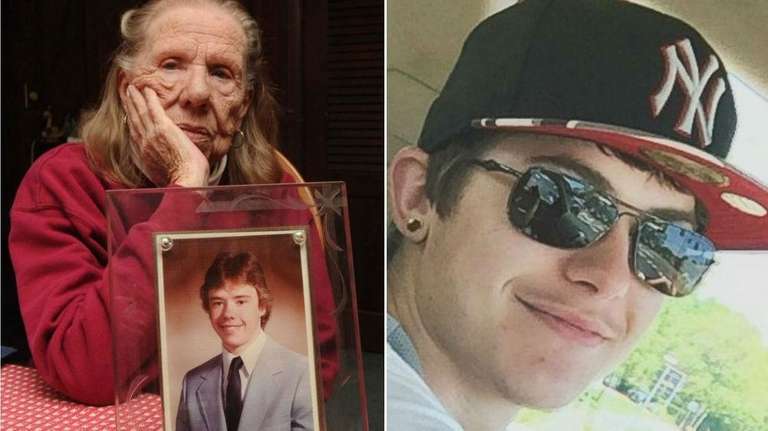 Melissa Penny, 78, of Hampton Bays, on Monday, April 6, 2015, with an undated photo of her son Brett Penny, who was allegedly stabbed by Michael Doroski, right, during a road rage incident in Calverton on April 5, according to police. Brett Penny was driving his mother home after they ate an Easter meal with extended family when they noticed a red Ford pickup traveling behind them -- very closely -- on a rural stretch of two-lane road in Calverton. "Brett stopped the car," said his mother, Melissa Penny, 78, of Hampton Bays, who tearfully described the Easter day incident to Newsday Monday. "He said, 'What is wrong with him?' "
Brett Penny, 48, got out of his mom's Black Lincoln and approached the truck, she said, and returned stabbed and bleeding. "I opened the door to go see," said Melissa Penny, who said she stayed in her front-passenger seat and didn't turn around to see the altercation. "And he's going, 'Mom, I think I'm going to die. I think he stabbed me in my heart.' . . . He laid down on the ground, and passed out or whatever. And I'm going, 'What do I do?' "
In what Riverhead police described as a violent road rage incident initiated by apparent tailgating, Michael Doroski, 25, of Wading River, stabbed Penny in the chest and left hand during a "struggle" about 3:30 p.m. on Sound Avenue near Fresh Pond Road. Doroski, according to his family, was alone in his truck and on his way to eat Easter dinner with his girlfriend, Iris Garrido, 20, in Southold. Doroski's mother, Marie Doroski, 55, told Newsday Monday that her son was "tailgating him a bit" and Penny slammed on his brakes and punched her son several times. Michael Doroski, she said, was afraid for his life and stabbed Brett Penny with a pocket knife in self-defense. "The guy evidently stopped in the middle of the road, stopped all the traffic and opened up the door and started pounding on him," said Marie Doroski, who said she spoke to her son Sunday at the Riverhead police station, where he was "shaken up" and crying. "I guess he was tailgating him a bit, so he [Penny] brake-checked him a bit, so he backed right off. I guess he [Penny] wasn't satisfied with it." Doroski, who drove to the Riverhead police department immediately after the attack and turned himself in, pleaded not guilty Monday to second-degree assault and was ordered held on $10,000 bail, according to the Suffolk County district attorney's office. He was represented by a Legal Aid attorney and is due back in court Thursday. 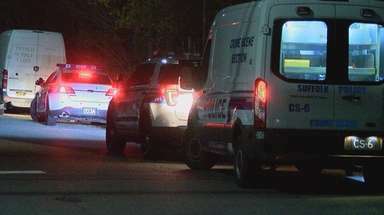 Penny, who was not charged, was in stable condition Monday at Stony Brook University Hospital, police said. Riverhead Police Det. Sgt. Edward Frost said Monday the investigation is ongoing and declined to provide further details. Garrido, Doroski's girlfriend, said Monday he was supposed to pick her up and go to her family's home for Easter dinner, and told him to hurry up because they were running late. 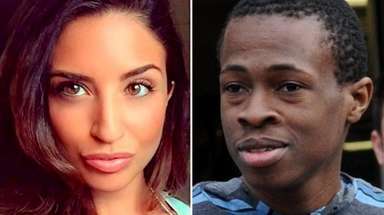 "Mike was probably in a rush to get to my family's house," she told Newsday. About 3:30 p.m., she said, he called and said he thought he'd upset the driver ahead of him. "I'll call you right back." The mothers of the two men expressed regret for the Easter incident -- but steadfastly defended their sons. "I just wish the guy hadn't been . 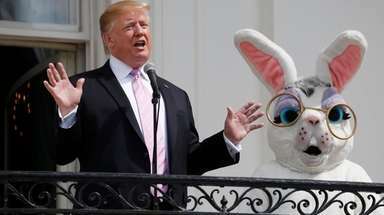 . . [behind us]," said Melissa Penny, who said her unemployed son, who is single and has no children, has lived with her for the past 1 1/2 years. "And I wish Brett hadn't gotten out of the car. . . . I don't believe that he opened the car door and hit him. That's not Brett. I could imagine him [Penny] yelling at him." Marie Doroski of Southold said her son is an electrician and had to protect himself. "He was attacked," she said. "This guy was a big guy; Michael's a little guy. What choice did he have? He was pinned in his truck. What would you do? I'd certainly fight back if I could." Melissa Penny, who said other drivers and nearby residents assisted her and her son during the incident, visited Brett in the hospital Monday and said he's "in a great deal of pain." She told him the road-rage stabbing had made the news. He replied, "Figures." To Long Island drivers, she advised: "Give cars some breathing space. God, it's unbelievable. Go slower."